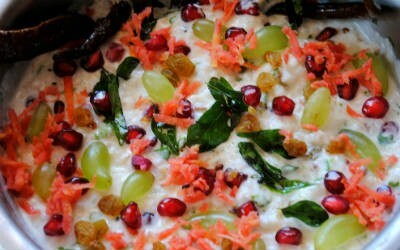 Curd rice is often called as Bagala Bath amongst Tamil Brahmin community in South India. 1. Pressure cook the rice till slightly mushy. 2. While it is still warm add salt, butter, asafoetida powder, ginger, green chilli paste, milk, curry leaves and coriander leaves. 5. Fry the mustard seeds, dry red chillies and cashewnuts for 30 to 45 seconds. 6. Add to the rice along with curd. 8. Finally, add pomegranate seeds and grapes. 9. Mix again and serve. Tip: You can also add grated carrot and raisins if desired. Feel free to comment or share your thoughts on this Fruit Bagala Bath Recipe from Awesome Cuisine.